Day trips in NJ are a great way to travel without needing to go too far from home. Whether looking for something to do outdoors on a sunny day, or someplace to visit when the weather is not so nice - you'll find a variety of great day trips in NJ here! The Experience Professionals - Flights Offered Daily (Weather Permitting)! For a romantic getaway, the OVERNIGHT ROMANTIC ADVENTURE GETAWAY PACKAGE combines the adventure of a Hot Air Balloon flight with the romance of elegant dining, followed by a comfortable night in a charming country Bed and Breakfast. 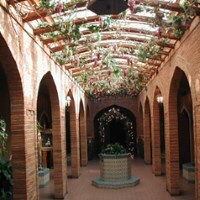 Surprise him or her with this unusual and romantic getaway. Combine a Sunrise flight, evening flight, dinner before or after - your choice. Let In Flight make all the arrangements. ENGAGEMENT FLIGHTS - Utilize their most popular flight, the Exclusive 2-Passenger Flight that allows you and your special someone to float together above the scenic and picturesque hills, fields and historic homes of Hunterdon County NJ. The DINNER FLIGHT offers a very unique trip. You and your significant other will enjoy elegant dining followed by a hot air balloon flight. 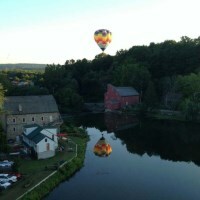 After dining you meet behind the restaurant for a quarter mile ride to the balloon launch site at Modica Farm. Surprise, a hot air balloon ride for just the two of you! In Flight also offers Exclusive 2-Passenger Flights, Corporate and Large Party Flights, Party Tethers, Multiple Balloon Launches, Group Rates as well as Gift Certificates. Your flight is followed by a complimentary champagne, non-alcoholic drinks and hors d'oeuvres tailgate party, providing a great opportunity for passengers to communicate with the pilots, crews and other passengers! Normally there are multiple balloons so passengers take photos of each other's hot air balloons and the photo exchange starts at the tailgate party with an exchange of email addresses. Voted NJ's #1 Day Trip for Kids and Families! 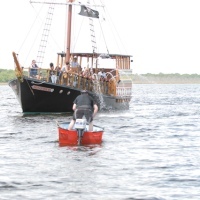 Come out to Brick NJ for a unique and fun pirate adventure day trip in NJ! Kids and parents alike will love the pirate cruise! Come out to find the treasure and sail with Jersey Shore Pirates for an interactive treasure hunt where your child becomes part of the action! The Sea Gypsy and its experienced crew sets sail daily on the Metedeconk River for a Swashbuckling Pirate Adventure. This true Pirate Adventure begins with face painting and dress-up as we transform your mini mates into our mighty Pirate Crew. One of the most unique day trip ideas in all of NJ! This historic village is a fun and educational place for the whole family. Walk through an 1800s village complete with a working blacksmith shop, bakery, general store, tinsmith shop, carpenter shop and more! Costumed actors go about their daily tasks and are happy to educate and answer visitor questions. Special events take place on weekends through the summer such as Civil War encampments, flea markets and harvest festivals. Allaire Village is open Wednesday through Sunday from Memorial Day through Labor Day. Day Trips in NJ for the Whole Family! This delightful town is a wonderful day trip if you enjoy shopping, browsing or people watching. Shops of all sorts can be found here, whether you are looking for unique artwork to put in your garden, special personalized gear for your beloved pet, vintage movie collectibles or specialty cooking accessories. There's so much to see, one can easily spend the entire day visiting the shops and still not have seen them all! Fred & Ethel's Lanternlight Tavern is a must-stop for when you are feeling peckish and the Smithville Bakery can satisfy your sweeter cravings. Children will love taking a ride on the carousel or in the paddle boats on Lake Meone. 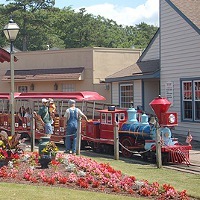 Stop to feed the ducks before taking a ride on the village train - a miniature old fashioned train that tours the village. Escape the hustle and bustle of the urban jungle and experience a different kind of thrill at Zoom Ziplines! 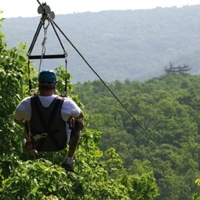 Take this exciting day trip in New Jersey and you'll reach speeds of up to 40 miles per hour down ziplines overlooking a mountaintop lake and the tri-state area. The guided tour lasts two hours and includes four ziplines, a suspension bridge, and a Unimog ride. You can enjoy all of this for $79.99 if you're an adult or $59.99 if you're a child or a senior. Or, you can opt for the $249.99 Family Pass, which is good for two adults and two kids. Looking for a day trip in New Jersey that's a fun combination of sailing and parachuting? 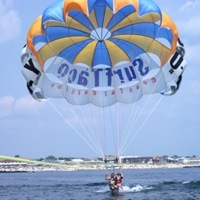 Try Belmar Parasail. You'll take off from the Belmartian boat and soar 500 feet into the air to enjoy the sun, the wind, and a spectacular view of the Jersey Shore! Fly single for $75, tandem for $130, or triple for $195. Discounts apply for military personnel and college students. And in case there's a little more adventure left in you, Belmar Parasail also offers banana boat rides for $25 per person. Try the Asbury Park Firework Trip, too. Great Fun for Water Babies! Got a brood of water babies? Treat them to a fun-filled day at Mountain Creek Waterpark. From the kiddie play area all the way to the stomach-churning 99-foot vertical drop slide and everything else in between, this waterpark has something for every member of the family! And it's easily accessible from New York City, making it an ideal New Jersey day trip destination. Tickets are $39.99 for guests over 48 inches, $27.99 for seniors and those under 48 inches, and free for kids under three. Check out the Mountain Creek website for the hours of operation. Spend a relaxing day taking in the beautiful sights along the Delaware River. Situated in a convenient location within the tri-state area, Delaware River Tubing offers fun river trips lasting four hours, making it an ideal day trip in New Jersey. Whether you like tubing, rafting, canoeing, or kayaking, Delaware River Tubing has the perfect package for you! All packages come with a free barbecue meal and a life jacket plus free use of changing rooms, restrooms, and showers. Visit the Delaware River Tubing website for the hours of operation and the rates. If you're looking for an absolutely amazing day trip in New Jersey, you can't go wrong with freefalling at more than 120 miles per hour! At Skydive Jersey, you'll undergo a training lasting less than an hour, go on a 20-minute plane ride, freefall for 50 seconds, parachute for 10 minutes before landing gently, and then go home with a lifetime of memories. 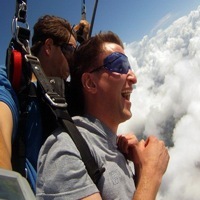 Skydive Jersey also offers a Media Package for an additional fee. Your entire experience--before, during, and after the jump--will be documented on video, leaving you with a physical remembrance as well as bragging rights!